ANDERSON, IN – It was billed as Round Three of a budding rivalry between two superstar harness racing pacers in Lazarus N (Yannick Gingras) and McWicked (David Miller) and the contest lived up to every bit of the hype, as on Friday (Sept. 21) Lazarus N defeated a hard-charging McWicked by a neck in a scintillating edition of the $177,000 Hoosier Park Pacing Derby at Hoosier Park Racing & Casino in 1:48.4. Unlike his last race at Woodbine Mohawk Park on Sept. 15 where Gingras drove Lazarus N rather conservatively after his second place finish to McWicked in the $462,000 Canadian Pacing Derby on Sept. 1, the 6-year-old stallion was placed right on the lead prior to the first turn. 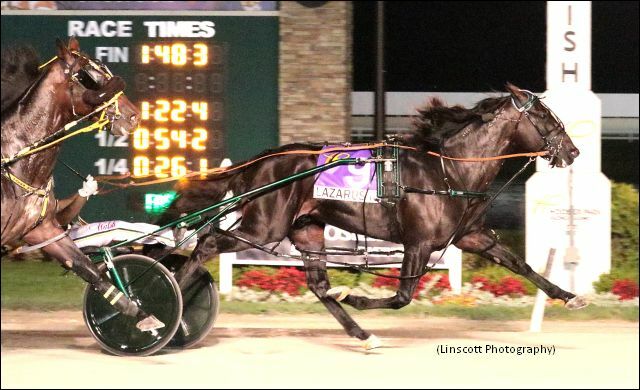 Leading the field of nine through a first quarter in :26 and the half-mile in :55, Lazarus N looked very strong on the lead he maintained over Filibuster Hanover and Split The House. 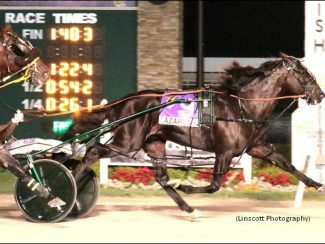 As Lazarus N hit the three-quarter pole in 1:23, McWicked was pacing comfortably in fifth place and when Western Fame moved first-over, he received a perfect second-over trip to commence his bid for victory. Around the final turn, the separation Lazarus N had placed between himself and the rest of the field began to vanish while McWicked swung to the outside to close with his customary power. As the wire loomed ever closer, McWicked was gaining on Lazarus N with every stride, but Lazarus N was determined and held off McWicked by a diminishing neck. 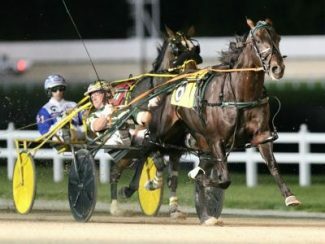 Donttellmeagain (Tim Tetrick) used a :24.3 final quarter to finish third. Sent to the gate as the even-money favorite, Lazarus N, a son of Bettor’s Delight, rewarded his backers with a payout of $4.40. McWicked, who is trained by Casie Coleman and owned by Ed James, was the public’s second selection at odds of 2-1, provided his supporters with $3.40. Donttellmeagain, (10-1) paid $4 for his third place finish.